What are the best e-commerce sites in Bangladesh? We make a list of top 10 E-Commerce Websites in Bangladesh. E-commerce industry has a subtle contribution to the economy of Bangladesh. As the Internet penetration percentage in Bangladesh has reached around 13.2%, it’s quite a bit noticeable that customers are nowadays using the online platform to buy their desired product. As a result, there are a lot of e-commerce websites in Bangladesh and they are growing at a tremendous level. This is because many young entrepreneurs have started their career as CEO or owner of an e-commerce website. Despite getting a job under large capital companies, they like to be rich by hard-working rather. Although e-commerce is growing gradually, the traditional business is downing. It may change all old model of our business while selling directly from manufacturer to customer. Although there is a lot of e-commerce and that may cross thousands, less than a hundred can make good profits. While shopping, people are more intended to go for options of convenience and are less concerned about price. As people are getting more occupied with other tasks, they search for easier and trustworthy online shopping options. And Bangladesh is ready to grab the opportunity of the potential market for the current online shopping industry. 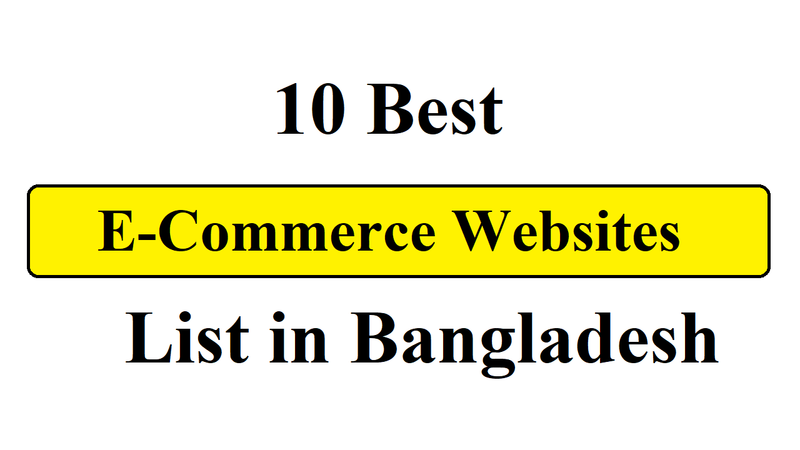 Well, let’s know the top 10 best e-commerce websites in Bangladesh. With a wide selection of electronics, fashion and home appliances, Daraz BD is of the leading e-commerce websites. Considering the popularity, this is the number one online shopping website in Bangladesh this time. They not only come with great deals on discount offers but installment facilities and warranty as well. Moreover, they offer product delivery and pickup options, which is a great option. As they claim 100% authentic product collection, they have different payment options including VISA card, Bkash, and cash on delivery. For a vast option of clothing, footwear, jewelry, accessories, electronics, appliance, books, restaurants, health & beauty products, PriyoShop.com is one of the most trust-able e-commerce websites in Bangladesh. Since 2013, it’s providing e-commerce business solution for shopping in Bangladesh. It became one of the top leading e-commerce sites of Bangladesh while having all the necessary facilities of an ideal e-commerce site. Ajkerdeal.com is also one of the familiar websites in online shopping with a vast arrangement of daily necessary products. Also, they come with various options for payment, including Bkash, DBBL, MasterCard, VISA card etc. If you want to purchase books of different interest then Rokomari.com is the most trusted e-commerce websites in Bangladesh. The most amazing part they have their own home delivery system in Dhaka, Chittagong, and Rangpur while operating their business since 2012. Apart from selling books, they also sell electronics and accessories at very reasonable prices. Not only in books but they offer a great deal with electronic products as well. And as a payment system, they are providing cash on delivery, MasterCard, VISA card, Bkash, and DBBL. This is another online shopping site, Kiksha that comes with different necessary products of our lives. However, it was named Beponee while it comes the first time. To make easy of the customers’ life they offer the home & kitchen appliances, lifestyle & electronics products, gifts etc. Also, they supply the product to their doorstep of the customers. For the payment options it offers EMI payment, cash on delivery, Bkash, MasterCard etc. although they are well known for providing quality products, their policy is very firm. That’s why it became one of the top leading e-commerce sites of Bangladesh while having all the necessary facilities of an ideal e-commerce site. Othoba.com is another great e-commerce website in Bangladesh, which is the sister concern of Pran-RFL. It not only deals with accessories but daily groceries, medical kits and much more as well. They offer the lowest delivery changes than many other sites of the similar business. But, there is a big drawback is that they don’t have enough assorted payment methods in the system. Othoba.com is the 6th most popular e-commerce business in Bangladesh according to our own judgments. From 2015, November 28, it officially started walking down the business allay. This is another trendy site for online shopping in Bangladesh is pickaboo.com, which was established in 2016. The days are gone when you had to wait for any relative or friend to come from abroad and bring your desired electrical devices. They not only have a great deal on electronic gadgets and appliances but cheaply priced options in this site. Also, they offer 100% authentic products at marked down prices with the original brand warranty. Moreover, they provide EMI payment, along with other popular online payment systems with the benefit of home delivery options. In addition, for any of their products has a very easy return policy. It has reached a significant level of success and ranked 7th in terms of popularity despite being new in the journey. It’s another great online shopping option in Bangladesh that comes with a trending website. As they claim to sell almost all kind of lifestyle products, they have the prosperity of having an engaging and customer satisfaction. They say that their main target customers are young that they offer more related products. Besides, one can easily find various articles on lifestyle-related topics as they have a running blog section. Moreover, among the e-commerce companies in Bangladesh, Bagdoom.com is the first one. As Bikroy.com is one the top-ranked online shop in Bangladesh, it gained the hype when it arrived at the raising moment of online shopping ideas in other countries. The site comes with the options to buy or sells everything locally across Bangladesh and it’s the best platform for local sale. Without any cost, you can advertise your product in more than 50 different categories. As it keeps pace with the best quality, site authority perceives all the advertisements. If you want to buy Electronics, Cameras, Computers, Phones, Fashion Accessories, Music, and Traveling goods then clickBD.com is the best online marketplace in Bangladesh. From your daily appliances, you can sell or buy almost every item on this site. Trading in a vast range of detail categories by the users of this site and it’s growing day by day. Although it has started its journey in 2005, recently this has been the most popular than its previous time.